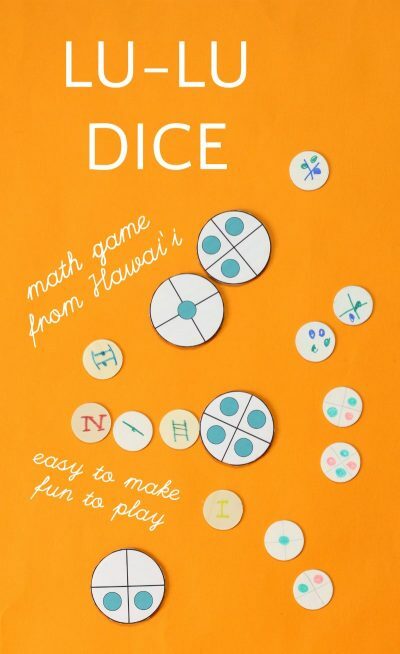 You and your kids may have never heard of Lu-lu Dice, but brace yourselves because you are about to discover an awesome new boredom buster that just so happens to have a sneaky math component. It’s a win-win situation: your kids will be occupied playing a fun game and learning something, will you will get some much needed time to check Facebook read People read War and Peace. 2 or more enthusiastic players. Objective: to be the first player to reach 100. Rules: Each player gets two tosses per turn. The first player tosses his four dice down on the table. Optional: shake dice in small cup before throwing them down. Next, he picks up any dice which landed face down (no points showing) and tosses them again. If all the dice land face up, he is allowed to pick all the dice up for his second throw. Thus, the maximum score for one turn is 20 (two perfect throws). Count the total points showing and record on score sheet. Play then continues clockwise until one player reaches 100. As with all traditional games, there are often different sets of rules, so don’t be shy about making up your own rules. You can vary the score, or how many throws each player gets. What are all the possible scores a player can get in one turn? How many different ways can each score be obtained? How many turns would a player need to reach 100 if he got the maximum number of points per turn? Ask kids to keep track of how many points they still need to reach the goal at the end of each turn. Traditionally the dice were made from stones. But you may not want your kids tossing rocks around your living room. (Ahem.) You can easily make the “dice” from small discs. Initially we make the dice from these small wooden craft discs I had leftover from making The Tower of Hanoi. Draw bisecting lines dividing the disc into quarters. On each disc draw dots. For the single dot, place it in the center of the disc. For 2, 3, and 4, draw the dots in the quarters. 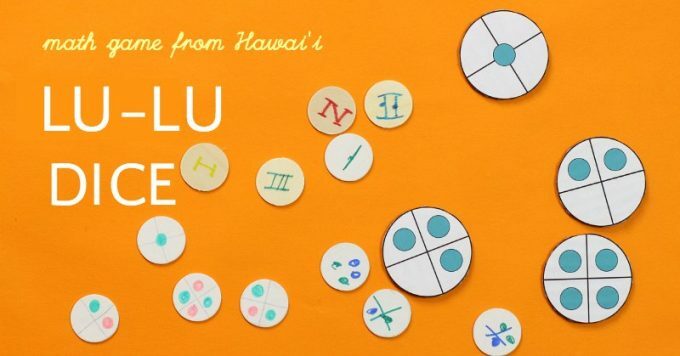 Alternatively, I created a lu-lu dice printable that you can use. Print it out here, glue to cardboard and then cut out the discs. We LOVED this game! Played with my 8,7, 5, and 4 year old. 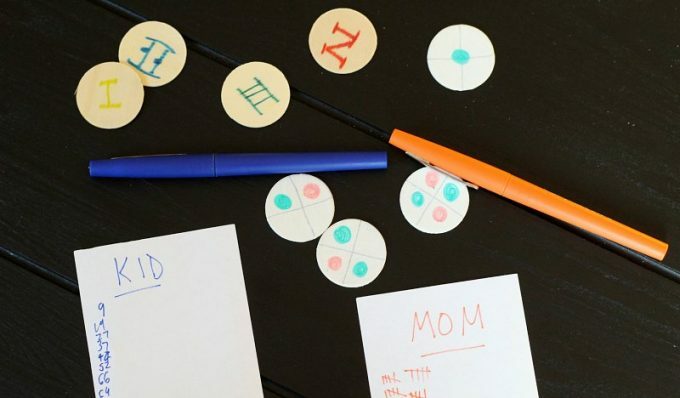 As a math teacher, I love finding new games that incorporate math. I let my 5 year old (who doesn’t yet add) use our abacus to keep score,which worked perfectly since we played to 100! Thanks for letting me know how much you enjoyed the game! Hi Erica! Although we didn’t try this game (yet! ), I want to say Thank you for the passion and the time you put in your blog. It’s one of my favorite online resources. We, as a family (parents + 5yo) equally love books and games. Not only did I buy lots of books and games recommended by you (never disappointed! ), but I also use your blog whenever I find a new book/game to see if you know it and what is your opinion about it. However, the last one I bought (in a moment of inspiration) was not on your blog and I think you and your kids might like/love it. We do! No, it’s more: we are addicted! It’s called Qwixx, it’s from Gamewright, it’s a dice game (very strategic though!) and it’s super fun. Thank you for the recommendation, I am looking forward to finding out more about Qwixx. I am delighted to know you have enjoyed using the blog as a resource! Directions are minimal, you just pick up a card & play.